As in many myths and legends, behind the gesture of a single man there is often the intervention of several secondary characters whom, with their contribution, allow the protagonist of the story to complete an otherwise impossible venture. 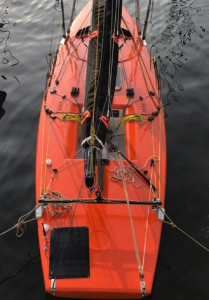 The “hero” of this story is called Dario Noseda, who will attempt for the first time a solo crossing of the Atlantic Ocean on board a Star boat, while FLY SOLARTECH will play the role of “helper” by providing a system of photovoltaic panels able to meet the electrical needs for a trip of nearly 3000 nautical miles. With great pleasure and honour FLY SOLARTECH is therefore becoming a technical partner in this Italian venture that will start in Las Palmas (Gran Canaria) in November and will see Dario engaged in a solitary crossing until docking on the first coast of the New World, In the charming Bahamas. The journey, as mentioned above, will take place onboard a Star boat suitably modified to face the the hard travel conditions. Among the various partners Dario has entrusted to set up the crossing, FLY SOLARTECH will have the fundamental task of ensuring the energy autonomy of all the onboard instrumentation, without which such a trip would be insanely hard. The photovoltaic system Dario will use for his boat is composed of two semi-flexible ETFE panels with high performance cells, capable of generating a total of 140W (110W the first module and 30W the second) occupying a surface area less than a squared meter. This configuration, coupled with a pair of lithium batteries, will make it possible to supply all instrumentation and various on-board devices 24 hours a day. Driven by the typically Italian adventurous spirit, FLY SOLARTECH will follow with interest and attention all the preparatory steps for this arduous journey and at the same time invites the reader to discover more about Dario Noseda’s venture by visiting the starinoceano.com website where all the news and event updates will be published.